We cannot imagine mobile phone without apps. Right from booking air tickets, tables at restaurants, playing games to weather updates, we depend on apps for everything. So, it becomes critical for a mobile app development company to maintain the standards that are set by users. However, if you want to make your app appreciable and usable before you spend scores of money on marketing campaigns, you need to test the app thoroughly. With the growing demand for mobile phones as well as the differentiated patterns of usage, there has been variation in mobile phone types, operating systems, screen resolutions, network connectivity, etc. All these factors have added to the complexities. So, testing the app on various platforms and devices can be time consuming. However, mobile app development services can follow these smart processes that will ensure quality as well as save valuable resources. For testing the effectiveness of the mobile application UI design, you can either choose physical devices or emulators. During the initial development of mobile app, emulator proves extremely effective as it allows fast and efficient testing in agile environment. Emulators are available at affordable prices and these tools offer excellent options for bypassing the network. They can also make use of live environment through modem. These tools can be used to test prime application functionalities, when features are developed. Cloud testing is another step to test functionality of mobile app. Cloud computing offers a web based testing environment where an app can be deployed, managed and tested. Apart from providing on demand access to range of mobile devices, cloud testing environment increases return on investment by curtailing project costs. Cloud based testing saves app developers to set up on premise test environments that are time consuming and lead to project delays. Mobile applications run on network connectivity for supplying loaded functionality. So, you need to test the app in original network environments in order to know about the real scenario and for assessing the behavior of the application in real mobile network. You can use various network simulation devices for testing mobile application with different bandwidths, network speeds, etc. This helps in adding the desired value to testing activities. Apart from testing a mobile app in an internet connectivity situation, you need to take other factors into consideration like connectivity with high latency, limited connectivity, metered connectivity and no connectivity. Lastly, the automated testing procedure is what you need to perform. This provides consistency for testing during development phases and also delivers apt results during regression testing. Automated testing can be performed when the app bears long lifecycle. You can also use this testing procedure, when the frequency and scale of regression testing is high. Automated testing should be conducted for verifying app compatibility, when a new version of operating system is launched. For successful testing of mobile applications, compliance with customer standards is essential. If you are able to do so, it can lead to business growth. 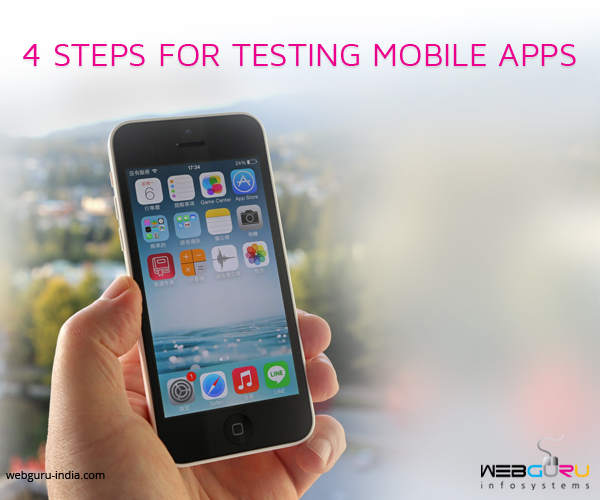 Following the procedures mentioned above for testing mobile apps will help you to do that. A useful description of steps of mobile app testing approach that would surely offer guidance when it comes to releasing the application successfully as planned. Thanks for sharing useful mobile app testing approach information… Keep updating your blog.